Software Resources International, Inc. was founded in 1994 to develop preventative maintenance software for the plastics industry. Based on Microsoft's Access database, ToolTrack was the first commercially available program to automatically integrate shift end information from a real time production monitoring system. Using that information ToolTrack automatically updated itself and generated forecasts for maintenance schedules for both molds and machines. This allowed maintenance personnel to plan ahead for routine tasks based on run time and time to job completion. ToolTrack was further enhanced to work seamlessly with real time production monitoring systems from Shotscocpe, RJG, Oxbridge Systems and Mattec. ToolTrack was sold by some of these companies as an option to their real time monitoring systems. In 1996 FleetTrack was added to the product line which was targeted at fleet maintenance operations - specifically school bus fleets and small police and ambulance fleets. Each of the programs was continually updated and in 1998 European versions were added and marketed through a European distributor. In 1997 SRI spun off a subsidiary company called The Foundation Marketing Group. Established to help small off-shore companies market their products in the US. TFMG established a network of manufacturer's representatives that were active in each client's target markets. These networks were often managed by TFMG for the principle. For the client this represented savings in both capital assets as well as payroll revenue resulting in a savings of both time and money. One of the many companies that approached TFMG was IPS, a corporation in Israel that manufactured a line of auxiliary molding equipment. SRI saw an opportunity to use it's existing plastics industry customer base to expand its product offering and subsequently negotiated the world wide distribution rights to all IPS products. Sales of these products have grown at an average rate of 20% each year since then and it is a significant contributor to SRI revenues. SRI subsequently invested in, and became a partner with IPS. 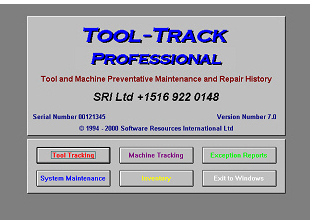 In 2006 ToolTrack was sold to Seltek Solutions in England who still market the product. SRI went on to concentrate on the line of IPS products, it’s website design and development, E-commerce business and web hosting,. SRI now sells IPS products through a worldwide network of partners.